Tutorial - Using heart tins as corner shelves! Here's an easy peasy and quick tutorial. 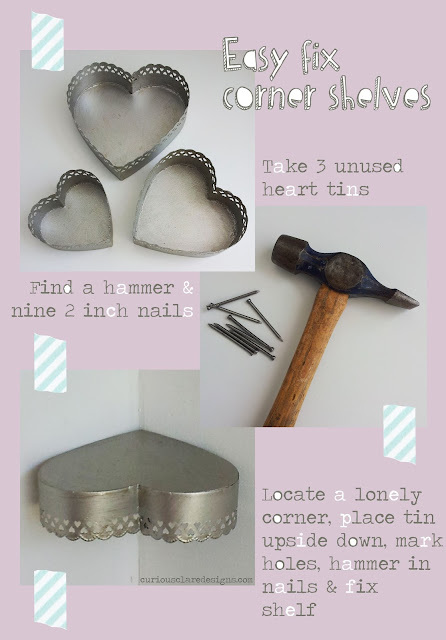 It all started when I spotted a bare corner in my studio at Local Creation, whilst also pondering what to do with three unused but lovely heart tins. Whilst playing around with them, I wondered what they would look like on the wall as they had holey, lacy edges (ready-made heart shaped nail holes!). I found that they looked better upside down as this disguised the fixings. 1.) Basically, take a heart shaped tin with a holey/lacy edge. 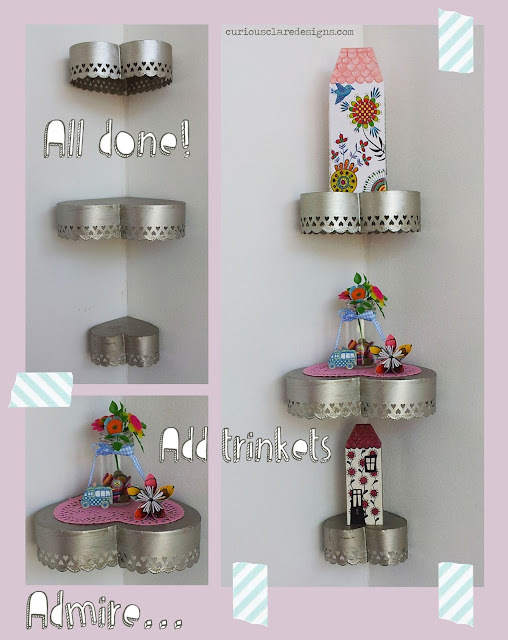 If your tin doesn't have ready made holes it would be simple enough to carefully 3x drill holes at each side where the tin touches the wall and one near the point where the corner of the wall will be. 2. )Using a pencil, hold your tin against the wall and mark where the holes are. Hammer in the nail part of the way to start off the hole. When you are happy that the tin shelf is straight and in the right place, hammer in the nail leaving 2cm protuding (this will help to secure the shelf). If you want your shelf to hold heavier objects then you will need to use screws/wall plugs and a screwdriver or drill to fix to the wall. I was happy for my shelf to be securely fixed using nails, as I knew that I would place only small light objects on top. 3.) Find appropriate trinkets, place on top and admire! I have used 3D paper houses, a jar of buttons & plastic flowers, a heart shaped doily, an origami flower (left over from my wedding), and one of my ice cream van brooches to decorate the shelves.